Postponed crossing but are we downhearted? No! It was pretty inevitable really. Our latest consultation with Daryl the Pilot concluded that the weather is just too unpredictable and windy to head across the Wash tomorrow as intended. We're looking at maybe Thursday or Friday now, with a high pressure area heading in there'll be more settled weather with lighter winds and warmer temperatures. So we stayed put at Kirkstead Bridge yesterday, joined by a couple a cruisers who tied onto the end of the pontoon in a heavy shower. Our convoy left this morning, a little piecemeal as we all had different destinations. 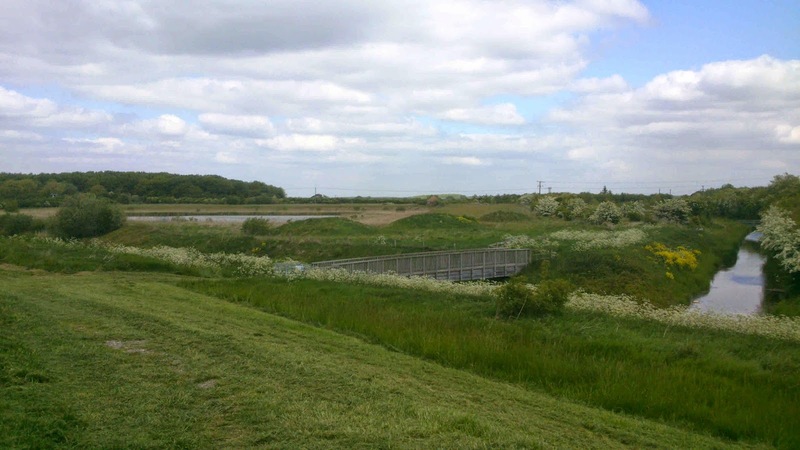 The dykes draining the flat fenland to make it suitable for agriculture feed into the river, with flood gates to prevent backfilling when the river is up. From Kirkstead Bridge the river seems to follow a more natural course, a bit windy but still heading purposefully south. All the river moorings we've come across so far are on floating pontoons. 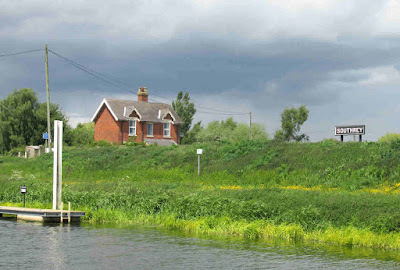 The junction with Kyme Eau, or the Sleaford Navigation, is a popular mooring spot. The navigation, the name suggests, ran all the way to Sleaford. Mostly based on the River Slea, it opened in 1794 and ran for 12 ½ miles through 7 locks. Officially abandoned in 1878 it was blocked completely by the construction of sluice gates in the 1940s, but recent restoration work has seen the first 4 miles, to South Kyme, once again made navigable. The aim of the Sleaford Navigation Trust is to re-open the whole length. Just the other side of South Kyme it crosses the Carr Dyke, an 85 mile long wide ditch heading south east towards Peterborough. Believed to be Roman in origin, it's purpose is unclear, though some sections were probably used for carriage of goods, others for drainage. It 's here also that the river changes it's name from the Slea to Kyme Eau for the rest of it's course down to the Witham. Below Chapel Hill and the junction the river has been considerably modified once more, straight and wide. Joe and Lesley on Yarwood following. They pulled over at Langrick Bridge, while we pushed on to Anton's Gowt. The local sailing club had taken over the visitor mooring pontoon for the afternoon for a mini-regatta, so we pulled onto the landing for the lock. 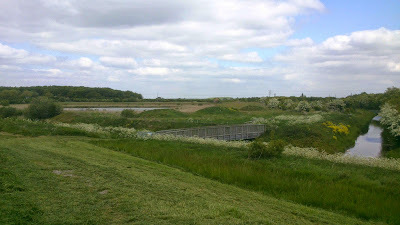 It's from here that the Witham Navigable Drains can be accessed. 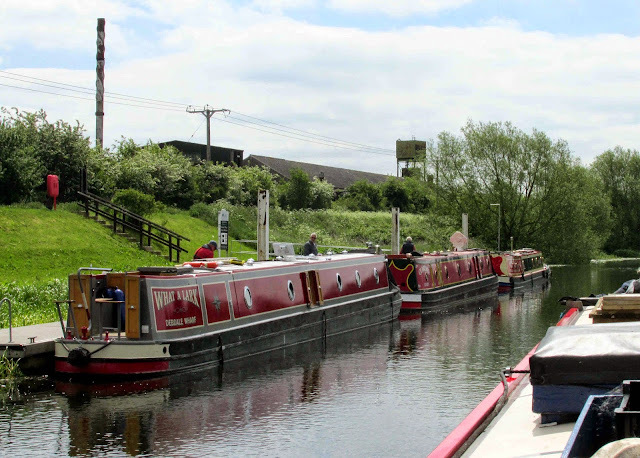 We pulled well back on the landing which gave a good 40 feet for boats in front of us, but a local boater said that the lock landing is often used for general mooring without any complaint. So we stayed here overnight. We were meeting Mag's son George and his partner Margaret here yesterday. They were coming by motorhome and had booked a pitch on the site behind the Malcolm Arms. One of the bunks was covered with stuff for us, a solar panel, aluminium rails and stainless screws to mount it, Mags new wheelchair for longer excursions, a new MPPT solar charge controller, 12v laptop charger, the list goes on. As well as the normal mail. Glad they came. They should have had a passenger, too. 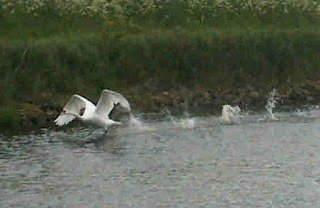 A good friend was coming with them to join us on the crossing but with the postponement he's not going to be able to. We're all disappointed. Fallow deer in an enclosure, spotted while out with Meg this morning. Hi Carol, we saw them, they were one of the cruisers that pulled on to the end of the pontoon at Kirkstead Bridge. Naughty-Cal. Like I said, a bright morning. The waterway coming in from the right is the old river course, rejoining here after a loop around to Short Ferry. The navigation was straightened in the early 1800s. It was about half-eleven when we got away this morning, we couldn't decide whether to go or stay. But we were still 22 miles from Boston and we need to be closer in case we do decide to make the Wash crossing on Monday. The Clarences had things to do, so followed on later. 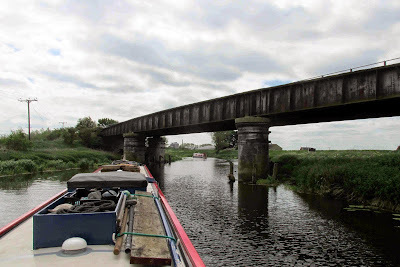 Passing under one of the disused pipe bridges. 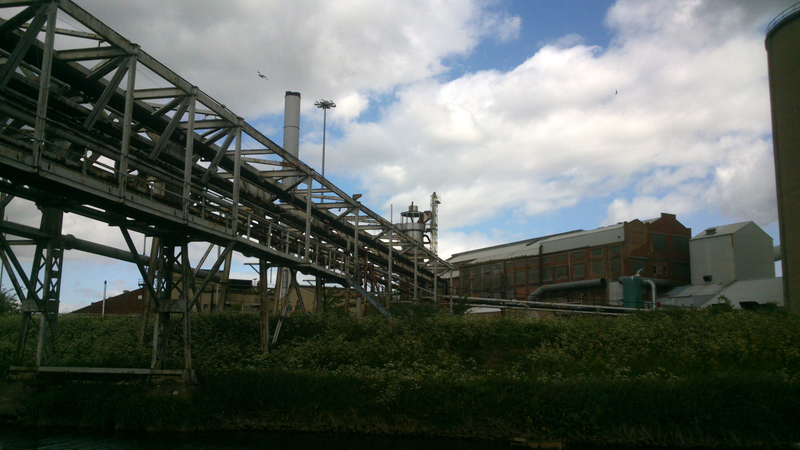 Settling ponds were sited on the south, opposite, side of the river to the factory. The plant closed in January 2001, after being in operation for just over 73 years. There are two mooring pontoons at Southrey, facing each other across the river. Both were empty this morning. The railway following the navigation has long gone, but the station buildings remain and here even the station signs still announce the stop. 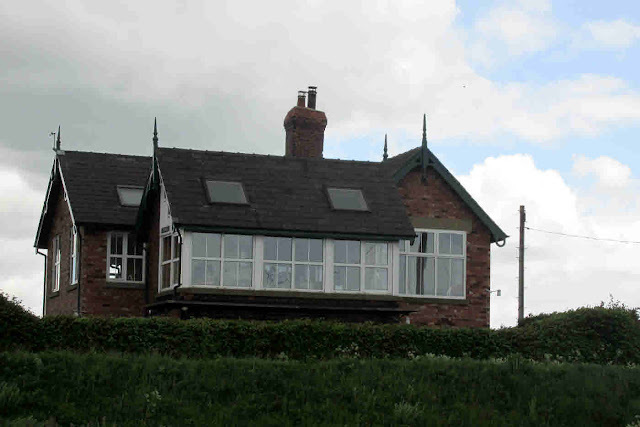 Further along, as at Southrey, the stations have been converted to private dwellings. We got caught in a short but sharp hailstorm, bracketed either side by rain. Joe complained he got one down his ear! But it had cleared by the time we moored and it's been a fine afternoon. Still windy, though. Our destination for today, Kirkstead Bridge near the town of Woodhall Spa. It's a long pontoon here, enough room for four narrowboats. The guy coming in on the above photo took one, so Clarence breasted up to Yarwood when they turned up. We've seen no plastic boats since Tuesday, only "narrers". The weather forecast is looking a bit more promising for Monday now, so we'll keep our fingers (and toes) crossed. We had a good afternoon yesterday, catching up with my brother Andy and his partner Donna. They’re thinking of buying a boat, so we spent the afternoon discussing boaty subjects (loos! ), comparing the pros and cons of narrow against wide beam, trad, semi, or cruiser sterns, lengths, and all the other factors you’ve to consider before buying. They will be living aboard but working for a while yet, so that has an impact on the style and shape. We had a really quiet couple of nights on the Fiskerton Fen mooring, joined by two cruisers on Monday night and two narrowboats last night. 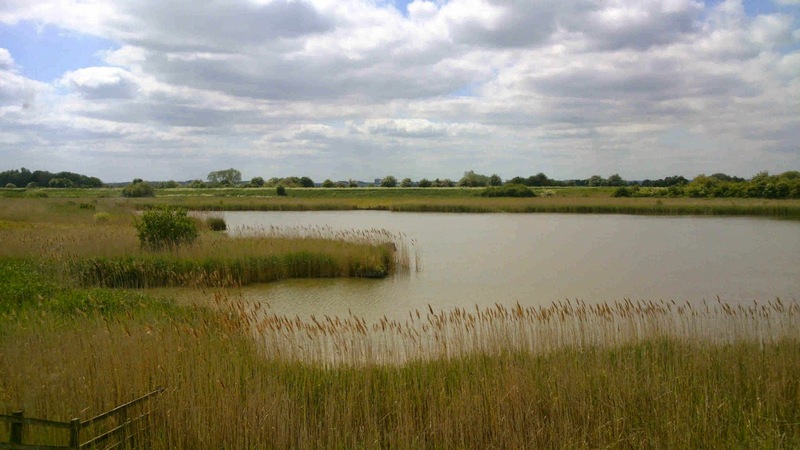 The Fen is an artificial wetland created in depressions formed by the extraction of clay. The nature reserve is not very big, but there are a couple of Permissive Footpaths in the area for longer walks. The water table is so effectively managed, with dykes criss-crossing the flat landscape, that most of the natural wetlands have dried out. I said that Lincoln Cathedral dominates the area, lit up at night it’s still clear to see even from seven miles away! This morning we set off to join the rest of our motley crew. 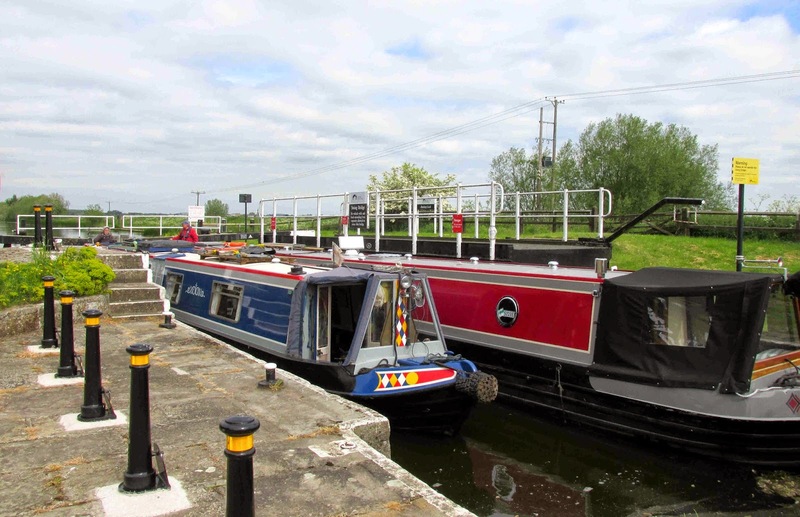 We caught up with the Wally’s (the new nickname for Dave and Lisa, NB What a Lark, courtesy of Joe) at Bardney Lock, filled and emptied at the facilities then shared the lock. Worth remembering, the pontoon moorings above the lock have electric hook-up. This is the last lock before Boston, still 22 miles away. The Witham valley has a very shallow slope. The Lincoln to Boston railway, built in 1848 as a branch of the GNR, was responsible for much of the the decline of the navigation. In 1847 over 19,000 tons of coal came upriver, by 1854 this had dwindled to less than 4,000. 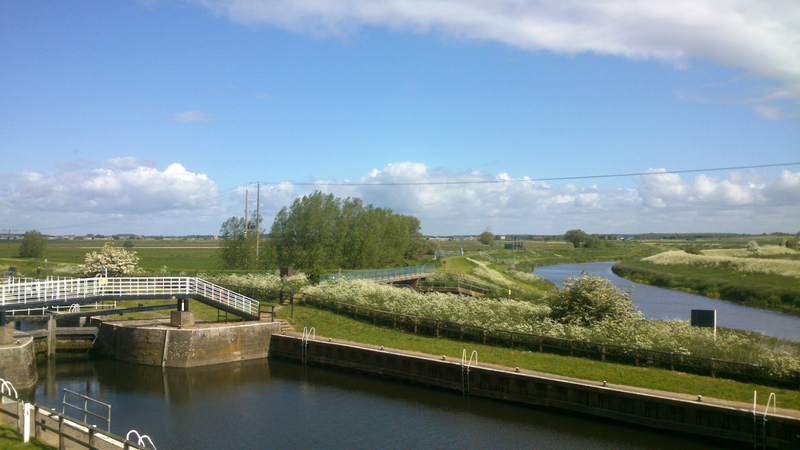 The river navigation still flows along under the wide fens sky as it has done for 1700 years, the railway closed in 1971 and is now a 33 mile long cycle way. Progress, eh. 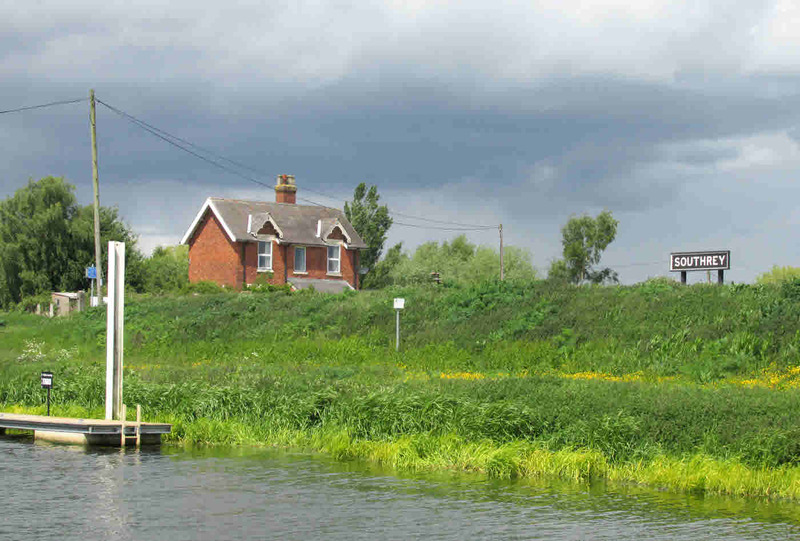 Yarwood and Clarence were moored on the pontoon at Bardney Bridge so we joined them. Looking at the forecast it seems unlikely that we’ll be making our Wash crossing on Monday. 20 mph westerlies are predicted, that’s Force 5 in maritime terms and far too high for ditch crawlers. It’s all up to our pilot of course, as it’s an offshore wind into a sheltered bay he might decide that it’s safe. We’ll find out nearer the time. Needing a bit of shopping I took my rucksack for a walk up into the village. The centre is about 10 minutes walk, and has a good butcher (today’s lunch and evening meal sorted) a small Co-op and Post Office. As well as ladies and gents hairdressers. During WWII the population of the village exploded with IX Squadron RAF personnel from Bardney Airfield stationed here. 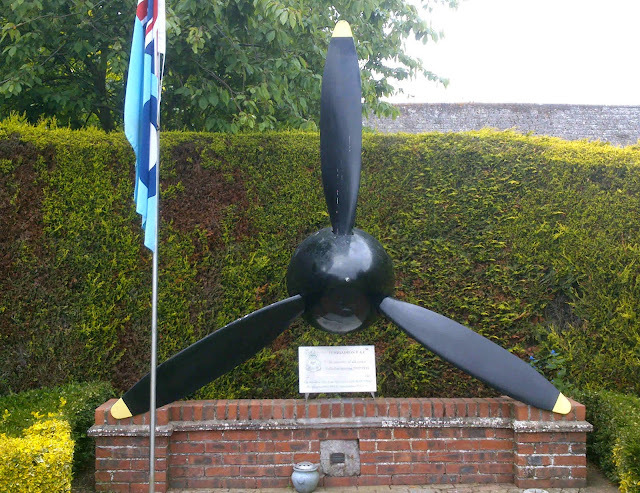 The village green has a memorial to the crews of the Lancaster bombers who flew from here. The airfield ceased flying operations in 1951, then served as a missile base for ICBMs till it finally closed down in 1963. Joe and I took a bus to visit a local transport museum yesterday. The clue to the majority of the exhibits is in the name of the attraction – the Lincolnshire Road Transport Museum is mainly dedicated to buses, so if you’re a bus enthusiast this is the place for you. There are also some fine cars and vans wedged in amongst the PSVs. Worth a visit if you’re in the area, and at only £3 it’s a cheap morning. I can’t understand why I didn’t take any pictures, but the website gives you plenty of info. This morning it was time to leave, so we reversed back to the services and filled and emptied before setting off eastwards. 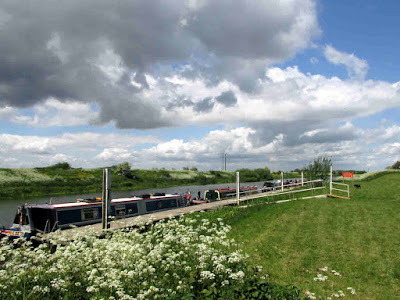 Passing Clarence, Yarwood and What a Lark on the marina moorings. At the far side of the pool, in the south-east corner, the River Witham makes it’s appearance. From here on to Boston we’ll be on the River Witham Navigation, first made navigable by the Romans around 300 AD. Being accessible from the sea made this one of the largest inland ports in the country. With trade came prosperity, and Lincoln was one of the wealthiest towns in England in the medieval period. 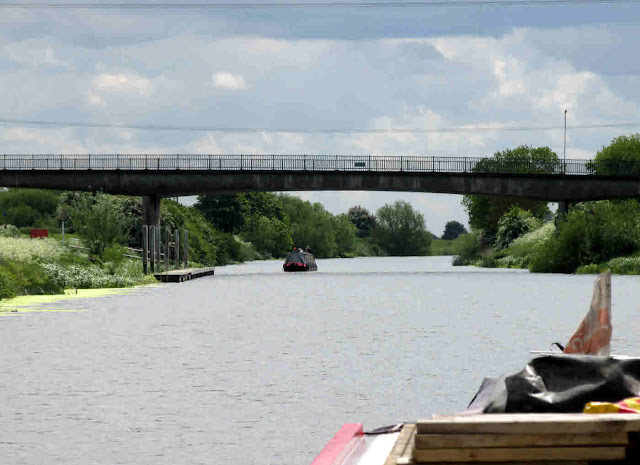 The river channel is narrow for a start, until it drops down Stamp End Lock, and is prone to fast streams so there’s a light system to advise boaters of the river condition. The Empowerment sculpture reaches across the river below the Glory Hole. There’s quite a lot of moorings along this stretch, but they’re overlooked by the shops and offices here. Stamp End Lock has caused some discussion amongst our flotilla since a boater heading to Torksey casually mentioned that What a Lark would be too big, at 70’ long, for the lock. A check of Nicholson’s Guide shows dimensions for the navigation of 75’ x 15’, but then it turned out that the cill, the concrete apron at the head of the lock below water level, intruded into the chamber a good 8 feet. Hmm. But Colin off NB Black Bart, a deep-draughted 70 footer, had been down and back up again, and he assured us that it was fine. And so it proved. Stamp End Lock, with a guillotine gate at the top and conventional pointy gates at the bottom. There’s a narrowboat just coming in from the bottom. We pulled up on the pontoon to wait, and I had a chat with the crew coming up and inspected the controls for the guillotine. Pretty well idiot-proof. The only draw-back is that it’s interlocked so that your C&RT key, needed to release the controls, can’t be retrieved without dropping the gate, an operation which takes several minutes. So I suggested that we nip in alongside while the gate was up, then the uphill boat could leave and close the gate behind them. In Stamp End Lock, the other boat just leaving. Of course we couldn’t have done it if they’d been a lockfull coming up. Apparently the procedure then is to simply swap keys. With the lock empty I gingerly reversed over the cill markers just to check the depth, and it was fine, so I let Dave and Lisa know. I suppose in really low river conditions it could be a problem, but normal levels leave the cill well covered. Out of the lock, two cruisers waiting to go in. Although we’re now on the river, it’s not much different from the Fossdyke. The course has been much modified, straightening and widening the bed to make it easier for boats coming in from Boston. The semi-industrial fringe soon gives way to flat open countryside, not that you can see much from the deck over the flood banks! The few villages either side stand back from the navigation, wary of flooding. There are pontoon moorings at Washingborough, and I had a second look at the building alongside. A glance at the map confirmed that it was a station building alongside the railway that ran parallel to the navigation. It’s now a cycle track. There were a few boats about, but not as many as you might expect on a Bank Holiday Monday. Maybe the weather put them off, certainly colder than it’s been these last couple of days. Since we arrived a couple of cruisers have joined us. 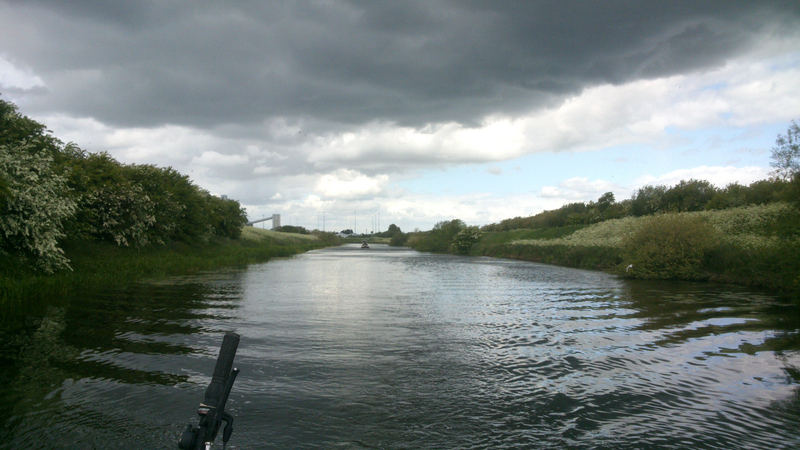 The rest of the flotilla have passed, heading for moorings at Bardney Lock, 1½ miles further on. We’ve stopped here because there’s road access a quarter of a mile away up the track, and we’ve visitors tomorrow. Thanks for the comments, Carol, Chas and Jaqs. We only scratched the surface here, there's so much to see! It's worth a detour down the Fossdyke for a few days to visit. Or in Carol and George's case, to live! Lincoln, what a great place to visit! A little off the tourist trail, but it shouldn’t be. From a fine range of shops, modern and a little older, to a magnificent medieval cathedral and a Norman castle, winding old streets and crooked timber-framed houses, the city is well worth a look. And, don’t forget, now on the 800th anniversary of the Magna Carta, there’s one of the original four surviving copies of the document open to view in the Victorian Prison within the castle walls. We moved down to Lincoln from The Pyewipe Inn yesterday to take up our pre-booked moorings at Brayford Pool Marina. The Brayford Belle takes tourists to Saxilby and back. Our moorings at Brayford Pool Marina. Mags wasn’t impressed, being stuck almost under a busy flyover didn’t appeal, so we pulled back onto the last remaining space on the C&RT visitor moorings where it’s more open. The remaining members of our small fleet did take up those moorings, however, so the marina didn’t miss out by holding them for us. This morning we set off up into this most impressive city, up, up the hill which was occupied by the original Roman garrison, then by the Roman city as the area was pacified, supports the vast, awesome cathedral and William the Conqueror’s earliest surviving castle, and probably the first Christian church in England. The Vikings came after the Romans toddled off back to Italy, leaving their influence in the street names, the Normans left their architectural genius, and it’s all still here to be seen. Remarkable. I won’t rattle on any more, there’s plenty of web resources to tap for more information. I’ll just add a small selection of the masses of photos I took today. And I’ll apologise in advance if (inevitably) similar views appear on Lesley and Lisa’s own blogs. David, Lisa, Joe and Lesley at The Glory Hole, the 12th Century arch over the River Witham Navigation. 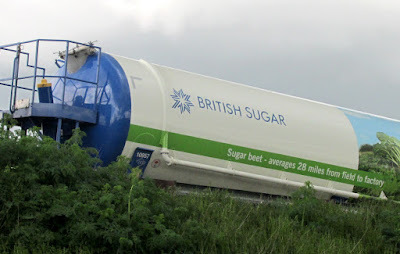 We’ll be ducking under there on Monday. Steep Hill is the name of the street up to the castle and cathedral. The house is The Norman House, as it dates from that period. It’s also known as Aaron the Jew’s House, an early bank. Christian’s, under church law, were not allowed to lend money. Jews, following the Norman invasion, filled the niche, and have been there ever since. The top of Steep Hill, the building at the top houses the information centre outside of which we picked up our very knowledgeable city guide, Vic. 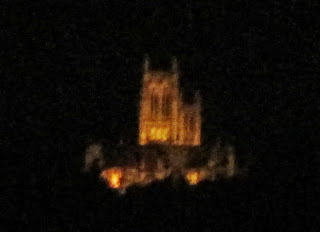 Photographs can’t do the size and attention to detail of the cathedral justice. The central tower supported a lead-covered wooden spire until it (the spire) was blown down in 1549. While it was still erect the cathedral would have been the tallest building in the world, holding this record for 230 years. Our guide took us around the perimeter of the early Roman city, indicating the visible remains of walls and gates, and telling us of the finds made and still to be revealed beneath the later buildings. A 1700 year-old Roman wall, part of the Basilica or central meeting place, incorporated into a much more modern building. That’s Vic, our excellent guide, on the left. He even took us down into the basement below a beauty parlour to show us the base of column, one of a row running alongside the Roman main street! They would have separated the thoroughfare from the Forum. This guy was a show-off. He did win the tournament, though. You can see the splinters fly from the shattered lances! A walk around the castle walls revealed extensive views over the surrounding countryside. Looking back towards the Trent Valley. The buildings within the walls are all post-Norman. The courthouse, still in use today, is on the far right, the nearer building are those of the Victorian prison. On the left is the original Motte and Bailey fortification, originally built in wood in 1068, then replaced by a stone structure a little later. Inside Cobbs Hall, where condemned prisoners were held prior to their public hanging on the tower roof. 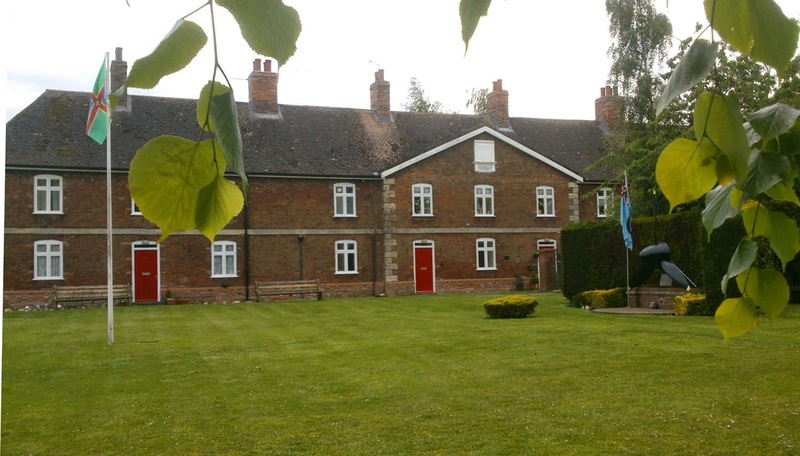 Inside one of the later brick buildings is the vault housing letters between King John and the Bishop of Lincoln, and Lincoln’s copy of the Magna Carta, which laid down the principles of modern government today. No photographs in here, though. …and an indifferent Harris Hawk. They also had several falcons and an Eagle Owl. Another owl had gone AWOL this morning during a display, but the handler was confident it would be found. A drop in to M&S on the way back down to the pool finished the day. A good day, well worth it. Highly recommended. Hi Andy. Shame you’ll not be able to capture our little flotilla for posterity, thanks for the thought, though. Enjoy your trip on the Llangollen. When is a Lapwing not a Lapwing? From the Trent to the Mersey.